According to Wikipedia, birds (class Aves) are feathered, winged, two-legged, warm-blooded, egg-laying vertebrates. The fossil record indicates that birds emerged within the theropod dinosaurs during the Jurassic period, around 150 million years ago. Most researchers agree that modern-day birds are the only living members of the Dinosauria clade. Click on photos for full sized images. This is the beginning of the cavity nesting season here in Northern California so I thought I would show you some of my favorite little dinosaurs. It’s hard to tell them apart on their first day out of the shell. The nestlings above, with the bright yellow gape and the nearly imperceptible white down are White-breasted Nuthatches (Sitta carolinensis). Their nest, which is one way of differentiating these species, is started with bark flakes and lumps of earth laid on the floor of the cavity; with a cup of finer bark shreds, grasses and rootlets, but mainly lined with fur, wool, hair, and feathers. The Ash-throated Flycatchers (Myiarchus cinerascens) pictured below start their nest base with dry cow or horse dung. The cup is made up of dry grasses, rootlets, and weed stems, then lined with finer grasses, hair and fur. The nestling has darker down and whiter gape flanges than the nuthatch nestlings. The Western Bluebird (Sialia mexicana) is probably my favorite. After all, they are the species that got me started building nest boxes in the first place. 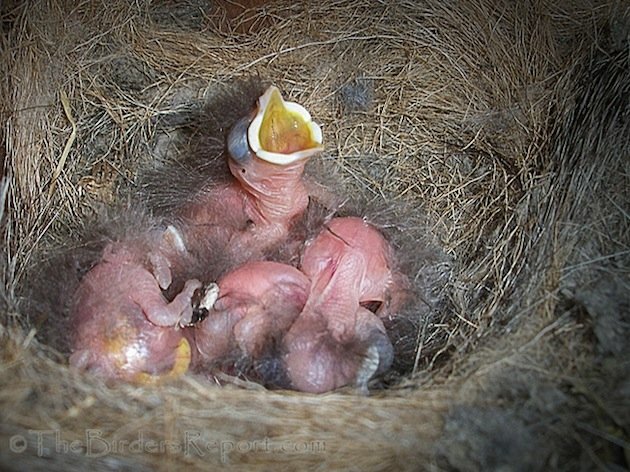 You can see that they hatch out with much more down which is a dark bluish-gray color. The nest is almost entirely made with dry grasses, sometimes with a few feathers. 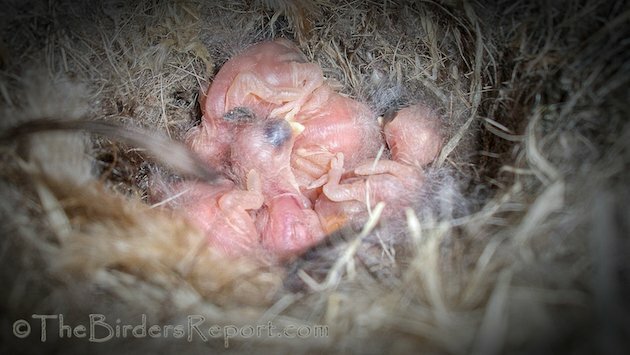 These newly hatched nestlings belong to a pair of Oak Titmouse (Baeolophus inoratus). 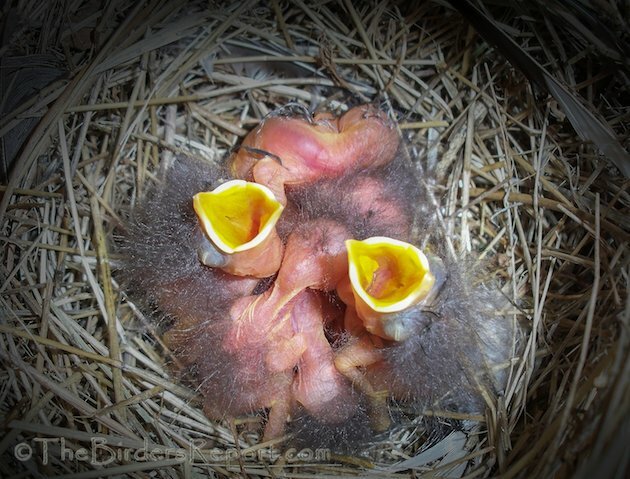 The featured image at the top of the post is the same group of nestlings showing one of them begging for food. 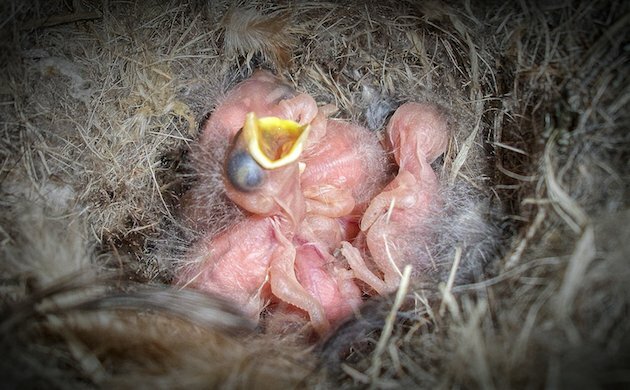 All of these cavity nesting species are born altricial, which means their eyes are closed and they are mostly naked and totally dependent on their parents for food and temperature regulation. If you want to learn more about nest monitoring there are a couple of excellent guides. 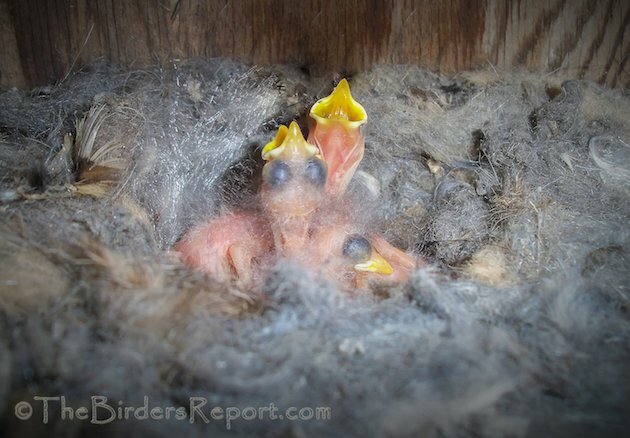 The North American Bluebird Society has a fact sheet on monitoring Bluebird Nestboxes here. Cornell Lab of Ornithology has an entire program for nest monitoring called NestWatch. You can get their NestWatch manual here and learn about the whole process at NestWatch.org. The most dinosaur-looking chick I ever saw was those of the Brandt’s Cormorant. I can see how any Cormorant would be high on the list for dinosaur look-alikes Duncan. If you have seen Katrina van Grouw’s “The Unfeathered Bird” many of the birds resemble dinosaurs without their feathers. Can you help identify two birds we’ve found, seemed to be abandoned, no nest nearby? We are living in Ecuador and there isn’t a wildlife refuge here that could help.